Steer clear of derelict spaceships! Superbly detailed statue of the derelict ship in Alien. Limited to just 500 pieces, it measures 21-inches long! The base replicates the bleak rocky surface of LV-426. Steer clear of derelict spaceships… but not this one. You're gonna want it in your collection! 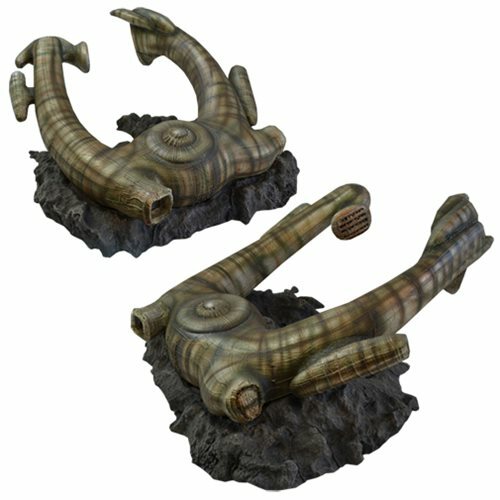 This superbly detailed Alien Derelict Ship Statue captures the organic nature of the derelict ship in Alien, complete with a base replicating the bleak rocky surface of LV-426. The 21-inch long museum-quality model is made of heavyweight polystone, hand painted, and limited to just 500 pieces. You might want to stay on board Nostromo! Ages 14 and up.